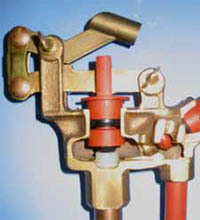 CESCO BRASS is a leading manufacturer and supplier of commercial quality toilet fill valves (brass ballcocks), flush valves, toilet tank flush levers and handles, other toilet tank trim, replacement parts, and accessories. Professional quality "Burlington Brass" and "Scovill" brand toilet tank repair and replacement products are simply the best. Our toilet fill valves regulate and relieve excess water pressure and water hammer and remain whisper quiet. Our products are as suitable to the current (1.6 gallon) toilet designs as they are to the older 3.5-gallon toilets and many century-old toilets. Plumbers, maintenance professionals and homeowners install our products with confidence because they are as durable and reliable as the best one-piece, two-piece, and wall hung gravity flow china toilet fixtures from major toilet manufacturers, including American Standard, Briggs, Crane, Eljer, Gerber, Kohler, Toto and Universal Rundle. This web site offers information on CESCO's products and Newsflush Bulletins covering many frequently asked questions related to troubleshooting, maintaining, and fixing toilets that leak, waste water, make annoying noises, and fail to flush and fill properly. The On-Line Store is a secure, convenient, reliable, and economical direct factory outlet for both do-it-yourself toilet repair individuals and plumbing professionals to purchase our premier products at Internet Prices. Since our retail and trade distribution is far from intensive, our On-Line Store is designed to serve customers that otherwise are unable to conveniently purchase our products. As a Qualified Service Plumber or Plumbing Professional, the On-Line Store provides an opportunity to register your company for special Internet Trade Prices and processing your on-line, faxed, telephone, or email purchase orders. In all cases, CESCO adheres to strict confidence in our customer relationships. Contact lists are never traded with or sold to other parties. Customer requests, needs, and preferences guide all of CESCO's product improvements and additions. If you have any questions, suggestions, or complaints, we would be happy to hear from you. We value your business and respect your opinions. CESCO BRASS a division of Barry E. Walter Sr. Co.